I can't imagine a more romantic city for spending Valentine's Day than Paris. It might be too cold for an intimate picnic on the banks of the Seine but there are still plenty other budget friendly ways to celebrate with your special Valentine in Paris. 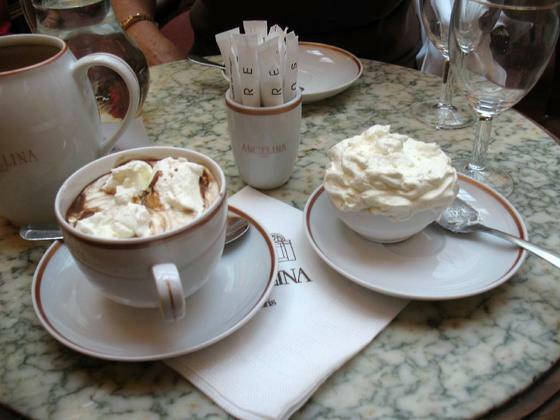 Enjoy a chilly romantic stroll through the Tuilleries Gardens and then head right over to Angelinas for a cup of decedent hot chocolate. Angelina's Restaurant/Cafe has been a Paris favorite with locals and tourists for over a century. Sit back in the gilt and gold Belle Epoque style dining room and enjoy a deliciously rich hot chocolate with homemade whipped cream. 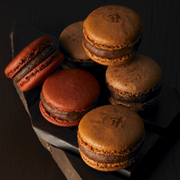 While in the neighborhood why not nip into the new Pierre Herme on 4 Rue Cambon and spoil your loved one with some of the best macaroons in Paris (sorry Ladurée but I really think his are better). Just in case my husband is reading my favorite are the salty butter caramel and the chocolate. The macaroons are expensive but you only need to buy one or two large macaroons and that will already be a very special and luxurious treat that won't break the bank. Champagne Cruise on the Seine River - skip the expensive 120 euro dinner cruise and instead try O Chateau's Champagne Tasting Cruise. For 40 euro per person you will sample three champagnes while cruising down the Seine River. An English speaking sommelier to tell your about French champagne and answer your questions about Paris. O Chateau also offers other wine classes in English and we list more information on our Paris tours with a twist page. Visit O Chateau web site for booking or further information. Sit in the front glass porch of the famous "Le Dome" restaurant and enjoy a glass of wine and nine oysters for 14 euro. You can soak up the atmosphere of this classic Montparnasse Bistro but without paying the 75 - 100 euros it would cost per person for dinner here. After drinks enjoy the lights of Paris from the top of Tour Montparnassee and then later maybe dinner at one of the less expensive restaurants listed below. Enjoy a good dinner at a very reasonable price at any of these Paris neighborhood bistros. These are all casual bistros with a lively neighborhood atmosphere. If you're looking for a quite sophisticated dinner then these may not be for you but check our more extensive list of favorite Paris restaurants for more options. Very cute but tiny bistro in the trendy St. Germain neighborhood. Unbelievable good value with starters from 3 - 5 euro and main course 11 - 15 euro. Wine is also very good and inexpensive. We had an excellent dinner for four with everybody enjoying 3 courses and two bottles of wine and all for under 100 euros. Service is also very friendly and fast. They do not normally take reservations but you can call to check for Valentines Day. Two course dinner menu with a glass of wine is only 15 euro until 9:00pm. Regular menu prices are 22 to 26 for two course dinner. Excellent unpretentious French food for very reasonable prices. The restaurant is very popular with the Montparnassee locals and mostly overlooked by the tourists. Staff are friendly and very efficient. Rue Didot is definitely a little off the beaten track and not scenic at all but this wonderful neighborhood bistro with a young energetic staff immediately makes you feel welcome. Classic bistro style restaurant with old wooden tables, red and white checkered napkins and a chalk board menu which they carry around from table to table. Classic French food including such staples as homemade pate, blanquette de veau and the house special "leg of lamb" for two.